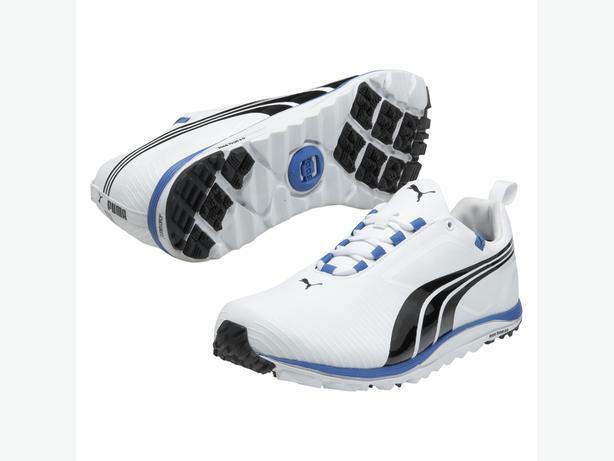 BRAND NEW PUMA FAAS LITE GOLF SHOES.-BRAND NEW!! A combination of FaasFoam+ (a proprietary blend of foam and rubber that is 25% lighter than previous foams) and lightweight materials in the lining package and tongue create an extremely light and comfortable shoe that weighs just 8.7oz. Microfibre leather with stormCELL provides super lightweight performance and waterproof protection. Zero heel-to-toe drop, corrugated flex grooves and SmartQuill traction technology is found to deliver a lightweight, performance golf shoe.